You may have heard a lot about solar panels and solar energy but you may not have heard about solar shingles yet. Solar panels are now being replaced by solar shingles mainly due to their beautiful appearance and power production capability. Solar shingles are a blessing for those who want to be self reliant on power and want to contribute his/her share towards keeping the earth pollution free. People all over the world are trying to minimize the production of greenhouse gases because they already know how harmful these gases are for our environment. Traditionally, power production depended mainly on burning fossil fuels which release large amounts of carbon dioxide into the atmosphere. To curb the production of carbon dioxide, it became necessary to search for alternative sources of energy that don’t harm the environment. Solar energy proved to be a viable alternative and to harness the energy from the sun, solar shingles are now used. If properly tapped, energy from the sun is more than sufficient to meet all our energy needs, both for domestic and business purposes. In appearance, solar shingles and traditional asphalt shingles don’t differ much. 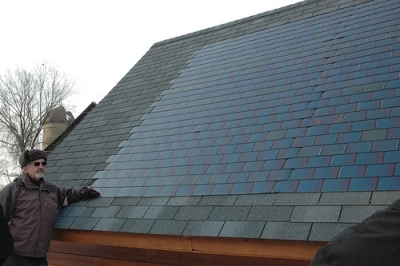 But solar shingles are mini solar panels, capable of converting sun’s heat and light into electricity. The electricity produced by PV shingles is DC which can be converted into AC using a converter. It can then power all the home electrical appliances. Shingles measure thirty centimeters in width and 218 centimeters in length. They are fixed onto the roof in the same way ordinary shingles are fixed. Up until now, solar panels were widely used to harness solar energy. A roof with PV panels on it presents an ugly look. Because of this reason, many homeowners did not like to have solar panels on their roofs. Researchers, in an effort to attract more people into using solar power, have come up with the novel idea of Photovoltaic shingles which give the roof a clean appearance. 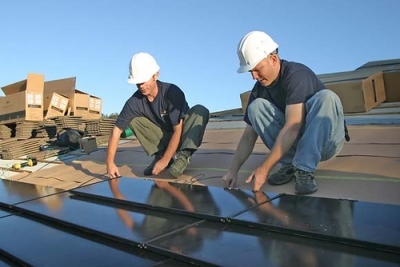 It was in 2005 that the first solar shingles were introduced into the market. The raw material used to manufacture these shingles is polymatrix material. Since the shingles and traditional asphalt shingles look almost the same, they can be used in combination, creating beautiful patterns on the roof. It is a fact that PV shingles are much more expensive than solar panels but people prefer installing solar shingles to Photovoltaic panels just because of the beautiful appearance they give to the roof. It will be a costly affair for old homeowners to replace old asphalt shingles with new solar shingles. But those who are building new homes can easily install PV shingles in the place of other roofing materials. Production of electricity by solar shingles depends mainly on the amount of sunlight they get. So it is important to choose those areas of the roof which get the maximum sunlight to install PV shingles and asphalt shingles can be used for other areas which get the least sunlight. Creative workers can create beautiful patterns using a combination of solar and asphalt shingles. From whatever point of view you look at the solar shingles, you will find that they are the best bet for being self reliant in energy and to preserve our environment from further degradation. Since you won’t be paying your monthly energy bills to the power corporation, you will also be making financial gains by installing solar panels on your roof.